The design itself is an innovative way to upcycle. 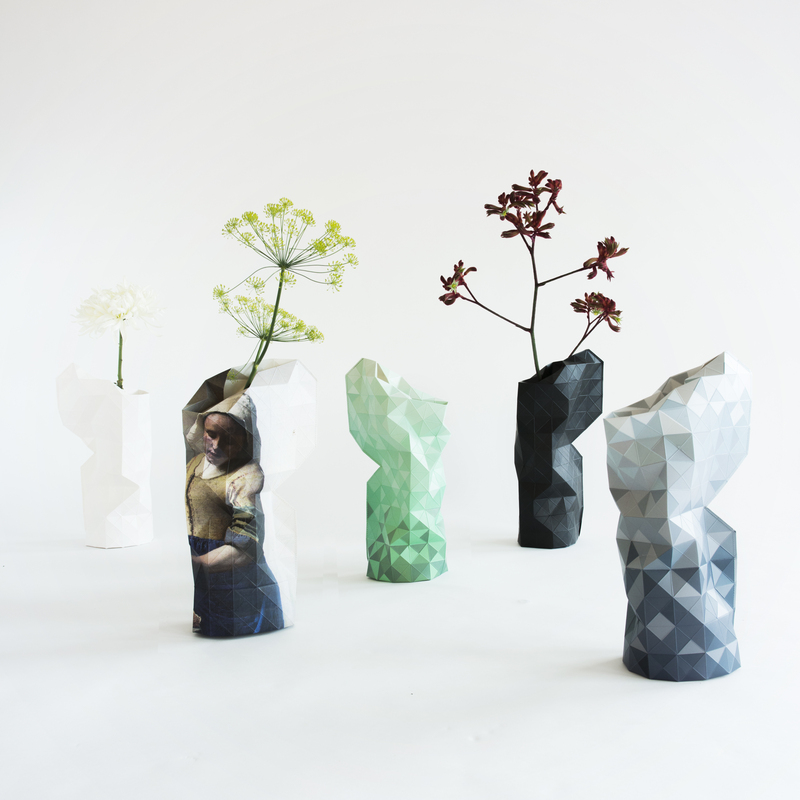 Each paper vase is actually a soft, malleable pocket (retailing for a modest €19 each, or about $29). The sleeve slips over any shape of pop or water bottle to create a sharp-looking flower container. The triangular tessellations expand and contract to mask tall or short, squat or skinny vessels. Coating on the paper (a bit like the wax on a milk carton) protects from water drops or slight spillage. But the real appeal lies in how the vases are produced. Each one is handmade by the Pardeshi community, a group of 700 people (or 120 families) who live on the streets of Mumbai’s red-light district. Addiction is endemic among the men, leaving women to care for the households. Traditionally, they have made money by weaving and selling generic bamboo baskets, earning about €1 per day per family. Their income has been declining, though, with the proliferation of cheaper plastic baskets from China. Through his paper-vase project, Heykoop currently employs 80 women for an average of €10 a day. Over the next six years he hopes to raise the rates to €15 a day (or more, depending on India’s rate of inflation) and employ 200 to 300 people. It could effectively raise the entire Pardeshi community out of poverty, allowing families to get health care and housing, and for the children to go to school. Heykoop, a graduate of the Netherlands’s prestigious Design Academy Eindhoven, started the project a couple of years ago. His cousin, Laurien Meuter, had been living in Mumbai, working for a bank. Disturbed by the high levels of poverty, she decided to start a not-for-profit organization called the Tiny Miracles Foundation (tinymiracles.nl). Meuter thought that a dearth of skills was a serious impediment to prosperity, and engaged Heykoop to impart some of his well-honed abilities (his quirky high-quality pieces – a €4,000 chair made of colourful children’s blocks, for example – have won awards in both Europe and Asia). At the outset, Heykoop tried to show the women complex skills – sewing and leatherwork – but had to pair down his designs: “It’s very easy to take the steps too quickly,” he explained recently by phone from the Netherlands. “Everything I did was too difficult to make.” Plus, “it took me 2 1/2 years to get their confidence. To trust who I am, and why I’m there. They thought I was spreading Christianity. “Now the project works perfectly,” he says. A couple of hundred paper vases sell everyday, through Heykoop’s website (pepeheykoop.nl), or in boutiques in Europe, Japan and New York. And, like all good designers, Heykoop is thinking of the future, for when “demand drops for the paper vases, as it did with the bamboo baskets.” He’s already showing the women how to make paper lampshades, imparting a different skill set, and giving another reason to be optimistic for the future. This piece originally appeared in the Globe and Mail on Thursday, April 24, 2014. This entry was posted in Design Spy and tagged Amsterdam, Decor, Design, Milan, Mumbai, Paper Vases, Pepe Heykoop, The Globe and Mail by mmhague. Bookmark the permalink.